Scientists at deCODE genetics in Iceland, a subsidiary of Amgen, today publish the first genetic map of the human genome developed using whole-genome sequence data. 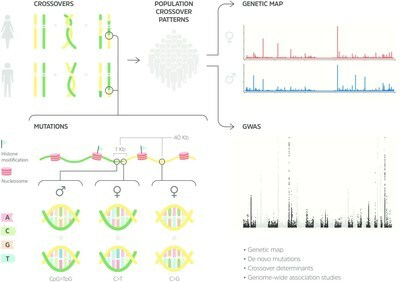 The map provides the most detailed view to date of the location, rate and connection between two key drivers of human evolution: recombination - the reshuffling of the genome that occurs in the formation of eggs and sperm; and de novo mutation - the appearance in every one of our genomes of dozens of usually small variations that we did not inherit from either of our parents. Together these processes guarantee that every person is a unique version of our species, but de novo mutations are also a principal cause of rare diseases of childhood. The study appears today in the online edition of Science. This paper presents the latest genetic map of the genome developed by deCODE using its unique population genetics resources in Iceland and made available to the scientific community. The first, published in 2002 with 6000 microsatellite markers, was instrumental in correctly assembling the first reference genome. In 2010, coinciding with the launch of the first commercial whole-genome sequencing machines, deCODE used 300,000 markers to create a more detailed map to guide the analysis of this new type of data. Today's study draws on sequence data from some 150,000 Icelanders from multiple generations, comprising nearly half the population and yielding the precise location of 4.5 million crossover recombinations and more than 200,000 de novo mutations. "Over the past twenty years we have been committed to studying and publishing on de novo mutation and recombination and their relevance to human evolution and disease. We have done this both because it is of fundamental interest to understand more about who we are as a species, and because here in Iceland we have unique resources to address these questions and their relevance to health and medicine," said Kari Stefansson, CEO of deCODE and an author on the paper. "The classic premise of evolution is that it is powered first by random genetic change. But we see here in great detail how this process is in fact systematically regulated - by the genome itself and by the fact that recombination and de novo mutation are linked. We have identified 35 sequence variants affecting recombination rate and location, and show that de novo mutations are more than fifty times more likely at recombination sites than elsewhere in the genome. Furthermore, women contribute far more to recombination and men to de novo mutation, and it is the latter that comprise a major source of rare diseases of childhood. What we see here is that the genome is an engine for generating diversity within certain bounds. This is clearly beneficial to the success of our species but at great cost to some individuals with rare diseases, which are therefore a collective responsibility we must strive to address," Dr Stefansson concluded. Based in Reykjavik, Iceland, deCODE is a global leader in analyzing and understanding the human genome. Using its unique expertise and population resources, deCODE has discovered genetic risk factors for dozens of common diseases. The purpose of understanding the genetics of disease is to use that information to create new means of diagnosing, treating and preventing disease. deCODE is a wholly-owned subsidiary of Amgen (NASDAQ: AMGN).